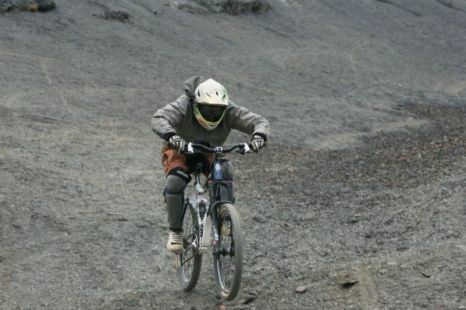 Extreme biking in Bolivia isn t just about the world s most dangerous road - Skreeing, which involves riding fast downhill, is the new kid on the block. Judging by the kit we’re wearing, skreeing, as it’s known, isn’t a risk-free art form. I’m in full-length shin-to-knee guards, protective jacket, gloves, goggles and a full helmet. For good measure, we make a sacrifice to Pacha Mama (Mother Earth), pouring a little alcohol on to the earth and our tyres, and take a sip. It takes all of ten seconds for me to wipeout. I come off again on the second run, my right shoulder taking the brunt of the fall. However, once you realise the deep covering of skree is actually a pretty soft landing, it boosts your confidence to go faster. Speed and confidence are the key things here; the faster and more solidly you ride, the more you tend to glide or zoom across the surface, instead of the tyres sinking into the skree. The runs are filled with jumps, curves, dips, long straights where you can pick up speed, dunes to climb and a natural half-pipe. I reach the bottom out of breath each time. Just before the four-wheel drive gives us a lift back to the top for another run, I look back at the other bikers starting their descents from the ridge and realise how far and how quickly we’re dropping altitude. As we break for lunch, a gloomy mist rolling across the mountains. I sit out the next few rides, the pain in my leg and thumbs too great. But after trying out the spare bike and realising it’s actually less painful to ride than to walk, I give it another go. I’m cautious at first but quickly get carried away and pick up speed. I see Phil, an expert biker, hit a hole in the ground and fall from his bike to do a face plant. Ted, another experienced rider, hits a dune and comes off with a face full of dust. We tally up; most of us have between four to eight falls each, some worse than others. We ride until late in the afternoon. Nursing injuries and covered in dust and dirt, we drink ‘victory beers’ at the bottom of the mountain, looking back up at the tyre trails we’ve created on the landscape. I’m glad I took a few more rides, despite the pain. Partly because it’s always good to get back on the horse after a fall and partly because the afternoon riding was so much fun. But mostly because I didn’t want to leave the skree fields of Bolivia as my unfinished masterpiece.